back to home page All sales are final. 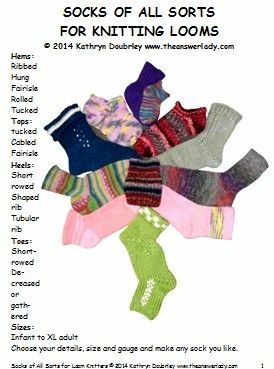 Loom knitting patterns are now divide by loom type into the categories below. You'll find freebies sprinkled throughout the pages so browse and have fun. Knit & Purl Tools and Kiss Looms are separate businesses from mine. But they are both run by trustworthy friends and I think you'll be safe and happy shopping with them. this category includes all looms with 2 rows of pegs facing one another that may be used for double knitting stitches. Kiss,Cottage, Knifty Knitter long looms and some KB looms may be used. Always check required gauge and peg count to see if a particular pattern will work for you. this category includes single knitting looms with plastic and nylon pegs such as Knifty Knitters, Cindwood, KB. Cottage Looms may also be used for some of these. Be sure to check peg count and gauge to see if your particular loom will work. This lace could be repeated across a larger fabric. There are 10 needles involved in the lace but cast on 14 so as to create an edge on each side. The basic design is to slip stitch 1 in each row, purl stitch 2, knit 10, purl 1, knit 1. But after we begin transferring stitches,some of the center pegs will get slipped in some rows. Where multiple stitches or loops are on a single peg, knit all of them over the next time a row is knitted. Row 3: slip 1, purl 1, knit 4, slip the 2 empty pegs, knit 4, purl 1, knit 1. Work stitch transfers on pegs 5/6 and pegs 9/10 in the same way as on row 2. This should leave 4 center pegs empty. Row 4: slip 1, purl 1, knit 3, slip 4, knit 3, purl 1, knit 1. Work transfers on pegs 4/5 and 10/11 using the established method. Row 5: slip 1, purl 1, knit 2, slip 6, knit 2, purl 1, knit 1. Work transfers on 3/4 and 11/12 using the established method. Row 5: slip 1, purl 1, knit 1, slip 8, knit 1, purl 1, knit 1. Row 6: slip 1, purl 1, knit 1, e-wrap the 8 empty needles, knit 1, purl 1, knit 1. Lift the floats that were formed while center needles were being slipped and hang them on pegs 7 and 8. Hang the top float on 7, the next on 8 and keep alternating until all 5 have been hung. Row 7: slip 1, purl 1, knit 10, purl 1, knit 1. When knitting the center 2 pegs with all of the floats hung, knit over ALL of the yarn loops. Repeat these 8 rows up the work. Both of these may be done on looms. Single knitting may be virtually identical to hand knitting on 2 needles. It requires a single row or circle of pegs. Some double knitting boards may be used one board at a time to produce single knitting. Double knitting is thicker and warmer than single knitting. The gauge tends to be a little bit looser than single knitting if the same yarn is used but it is not see through on account of the 2 layers of fabric. Both faces of double knitted fabric normally look like the knit side of single knitted fabric. This may be altered on purpose with special techniques, but generally, it is true. 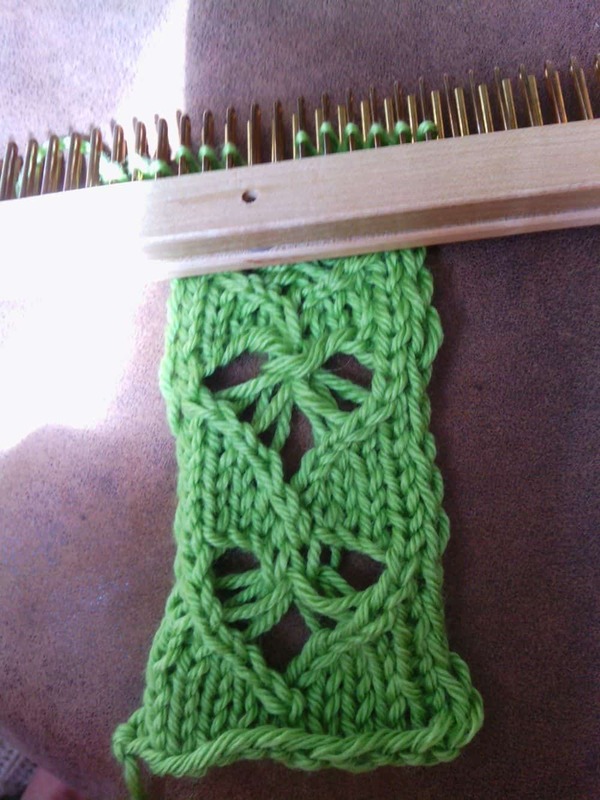 Double knitting requires 2 boards that are parallel to each other. The simplest is a purple version by Knifty Knitter. Kiss looms may be used as double knitting boards by removing the pin boards. The KB company made several boards specifically for double knitting. The All-in-One loom by KB may be used for either double or single knitting. Noble Knitter makes some boards that, while mostly designed with double knitting in mind, may be set for single knitting. Single knitted stockinette always rolls at the edges unless purl stitches are interspersed with knit stitches. Double knitted fabric does not do so. Cables and lace are possible with both fabrics. Shadow work is a technique that I invented and is only possible on double knitting. Use the 24 peg Kiss modular loom with no washers added or a small gauge loom set up for 24-30 pegs with 2-3 washers. E-wrap cast on around the loom. Knit in the round, knitting every stitch until work measures 8-9". Wrap as loosely as possible while knitting. The yarn has zero stretch so a tight wrap will be very hard to knit off. Bind off using the transfer method. Turn the tube inside out so that the purl side is out. Run a gathering thread through the cast on to draw it in and close that end. Knot securely and weave in the tails. Work a row of single crochet around the bind off working 1 SC into each bound off stitch 3 times then 2 SC into the 4th bound off stitch. Repeat around the entire edge. Cut the yarn, pull it through the last stitch and weave in the tail. The yarn has little fringes on it that create a nice scrubbing surface that exfoliates but is not overly rough. 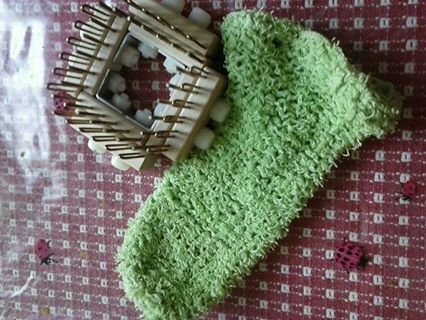 If a Kiss loom is not available, try this on any small gauge loom that can be knitted in the round at 24-32 pegs.